The scientific method is the important process by which all scientific knowledge is acquired. It is a tried and tested method that has been refined over the centuries leading to ever greater discoveries and a better understanding of the universe around us. The scientific method began with the rules of logic established by the Greek philosopher Aristotle. Over time other philosophers and scientists improved on his work refining the process of inquiry and proving of theories and hypotheses. The current version of the method is 6 to 8 steps depending on whether you are looking to explain an observed phenomenon, coming up with new methods, or integrating old information. The first step is to define the question. You look at the problem you are trying solve or the phenomena you are trying to understand and formulate a question that can get a solution. This step is the most important as asking the right question is more likely to lead you to the right answer. The next step is to collect data and observe. This is the part where you either study previous bodies of knowledge or observe the phenomena for the first set of clues needed to find the answer to your question. Observation when done properly will draw your attention to information you may miss at the first glance. The proceeding step is to form a hypothesis. This is your preliminary explanation of the answer to your question. If you are answering the question of whether an atom is divisible you would look at data of previous scientist observe an atom and make an initial hypothesis. You can say that given the data that the unique characteristics of different atoms must mean that atoms are made up of smaller particles that determine its differing properties. After the hypothesis are experimentation and more data collection. You find a premise or test to prove or disprove your hypothesis. In the case of whether an atom is made up of smaller particles we can use the example of Rutherford Hayes polonium experiment. He used a radioactive material in the form of cathode rays to bombard a material to see if it was altered. Data Analysis immediately follows your experiment. You look at the data to see if you found new clues. Depending on the data you may find evidence that proves or disproves your hypothesis. You finally draw a conclusion and see if the data supports your hypothesis or if you need to remodel it. This step often has scientists restarting the process so they can better refine their hypothesis or try a new approach. The final two steps involve publishing your findings and retesting where other scientists as well as yourself retest and experiment to see if the hypothesis holds up in all cases. Many times this can lead to the discovery of exception on theories and natural laws. We have written many articles about scientific methods for Universe Today. Here’s a podcast about The Scientific Method, and here are some Science Fair Ideas. 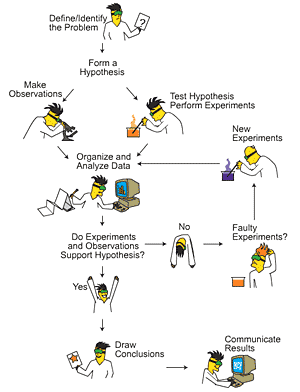 If you’d like more info on the Scientific Methods, check out NASA’s Scientific Method Article. And here’s a link to Problem Solving Using the Scientific Method. We’ve also recorded an episode of Astronomy Cast all about the Scientific Method. Listen here, Episode 90: The Scientific Method.